The second day of my Bourbon Trail Tour in Kentucky back in April had a very ambitious itinerary. We had stayed in a bed and breakfast in Lexington because that was very close to the three distilleries seen on Day One as well as Woodford Reserve which we couldn't do on Sunday. Brown-Forman Corporation, the same people who own the much larger Jack Daniels in Tennessee, which is also technically a bourbon but sold as Tennessee Whiskey. 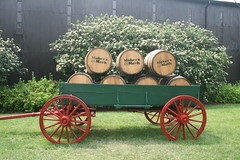 Fortune Brands which among many, many other liquors owns the much bigger bourbon brewer Jim Beam. In a heavily wooded hilly area deep, deep into horse territory, Woodford Reserve is a boutique small batch distillery specializing in the rustic traditions. While the distillery was rebuilt on the inside in 1993, the building dates to 1838 and they look it. 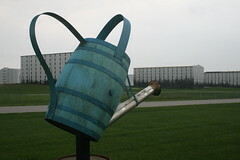 Heaven Hill is large sprawling area filled with storage rickhouses on a breezy hilltop. 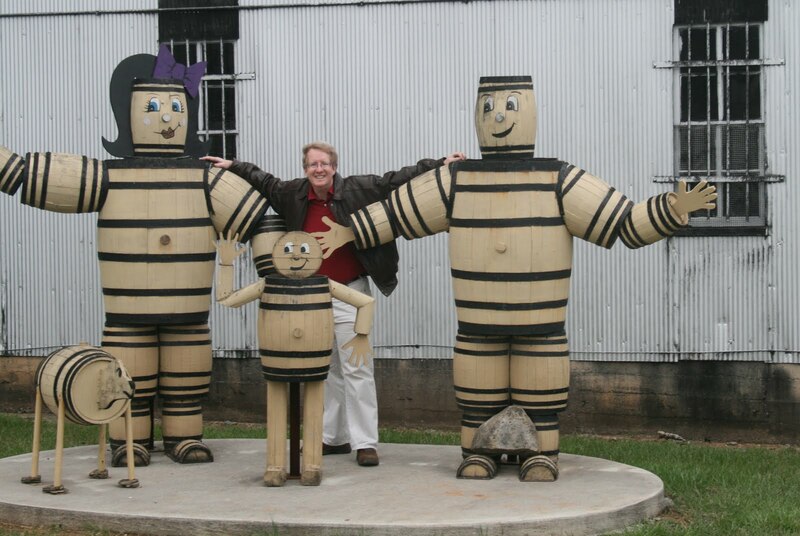 The grounds are decorated with whimsical sculptures made from bourbon barrels. Maker's Mark is way, way out of the way. It's over 45 minutes from Heaven Hill and it's all narrow country roads. The site was built as a tourist destination and it shows. All the buildings have a distinctive black and red decor. Fifteen minute movie emphasizing the age of the distillery and the old-fashioned techniques used. We missed the movie so we could catch a tour that was just starting, but by now they were all looking the same. They dispense with the movie, instead the original family house has been converted to a museum with all sorts of interactive exhibits. Bourbon is made by malting and then distilling a mixture of grains which must be at least 50% corn. The distilling process also has odd arcane rules. The only tour to charge money, it costs $5 to take the standard tour. The production area is all vintage style equipment including cedar fermenters and pot stills. 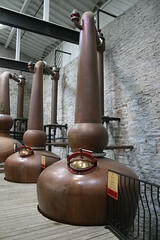 After a massive fire in 1996 which destroyed the distillery and several warehouses to the point the nearby river caught on fire, production was moved into Louisville, so the actual distillery can't be toured. The production area is very polished with lots of copper and brass but they don't let you get close to much except the giant fermenting vats. The other crucial definitive aspect of bourbon is that it MUST be barrel aged in virgin white oak for at least four years. As a small batch distillery, they have only one storage warehouse and it is just as vintage as the rest of site. The warehouse is just as old as the distillery and the rails they use to move the barrels between the two are very cool. The landscape is littered with warehouses and the smell of the "angels' share" is overwhelming. Since the tour basically consists of just the warehouse it is very detailed with examples of the ramps and lifts that used to be used to move and rotate the barrels until modern machinery took over. Most of Makers Mark is stored in off-site warehouses that litter the road as you drive up but they do have one display warehouse with a lot of tools and paraphernalia on display. Bourbons would all just be fancy brown booze if there weren't cool labels and improbable stories about the founders for the fancy shaped bottles. They were upgrading the equipment when we took the tour so it was closed but on a previous visit I had seen them empty a barrel into the trough for the small batch mixing. While bottling and labeling are done on site, it is not part of the tour. Bottling is done on site but was not in production the day we were there so they skipped it. There is no reason to go to a distillery if you aren't going to get to sample the goods. Since they really only have one brand, the sample is just one shot of the bourbon. That's pretty chintzy for a five dollar tour. They do have ice to add and bourbon balls to sample. The gift shop also has a sandwich bar where you can buy picnic supplies to take or eat on the grounds. Surprisingly it was one of the few places which sold food. It seems the local laws often don't allow that. The tasting room seats about two dozen people and is in the shape of an enormous barrel. The tasting consists of two premium bourbons including an 18-year-old Elijah Craig which was the second best bourbon we had. The tour guide gives a very detailed and entertaining talk about the enjoyment of a fine sipping bourbon. It really evokes the genteel snobbery of bourbon drinking. The tasting room is one corner of the gift shop with a large bar and seating area. Kids (and there were a surprising number of them on our tour) are kept across the room. They sample Makers Mark and the specially flavored Makers 46. Since it was near Derby time they also gave a shot of their mint julep flavored special edition which was awful. As the official bourbon of the Kentucky Derby, they had all sorts of Derby related special edition bottles. They will also emboss or engrave bottles for you. Most of the accessories for sale were very high end. The gift shop is right outside the tasting room and is Disneyesque in its displays and merchandise. They had a very wide array of the brands they sell including some very expensive special batches. Also a lot of different bourbon flavored foods and sauces. Lots of branded merchandise. Since their 'mark' is the wax sealed top, they have a special area where you can wax your own bottle (and that's not meant to sound dirty) but we didn't see anybody doing it. There is a lot of repetition to the shpiels and patters from each tour, but they each do a good job getting across what is unique about their brands approach to making a product which is rather tightly defined. The most vintage of the distilleries, if not really the oldest, it gives a good feel for the original methods and systems used. Definitely the most picturesque production area. They even have a cat who has the run of the plant. While the warehouse is very generic, the tour talk was one of the better ones and the tasting talk really helps you appreciate fine bourbons. The place is out of the way but worth the extra drive just for the overall picturesqueness. Personally I use Makers Mark as the dividing line between mixing bourbons and sipping bourbons. It's upscale but not wildly pretentious. A business junket which included a tour of Woodford Reserve was what inspired me to take the entire bourbon trail and if you can only visit one distillery, this would be the one to go to. But each of the others has its own merits as well. I wish Heaven Hill had more to their tour because the knowledge of the guides and the tasting experience was the best of all the stops. This is all getting me thirsty.